Here I will show you how to build a simple DAC using just the LaunchPad and a few common analog components! It has been quite some time since I have posted some code and after all that has been going on I now have time to write a new technical post! Though I developed this mini-project on the MSP430F5510, I have ported it over to the MSP430G2231 so it can be implemented using just a LaunchPad and some common analog components. This project came about because I wanted to automate signal to noise testing on a product I am making and I did not have the money for a new controllable digital function generator. 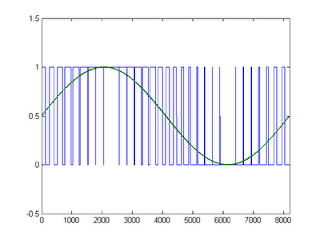 I needed a way generate a sine wave, then I needed to sweep across a certain small range of frequencies. At each frequency data would be logged and then analyzed in MATLAB. Sounds complicated, but the principle is very simple. I wanted to build a digital to analog converter (DAC) using an MSP430 that can generate periodic waveforms. I came up with this concept and decided to build it mostly out of curiosity since I could have just bought a signal generator chip or high-speed DAC at a very low cost. This post will show you how to generate a periodic analog signal using the LaunchPad and the MSP430G2231. For the sake of simplicity, I stuck to the default DCO value. This will allow us to generate a very clean sine wave at 128Hz. If the DCO is increased to 16MHz and a few other design parameters are changed the maximum frequency can be over 4kHz. 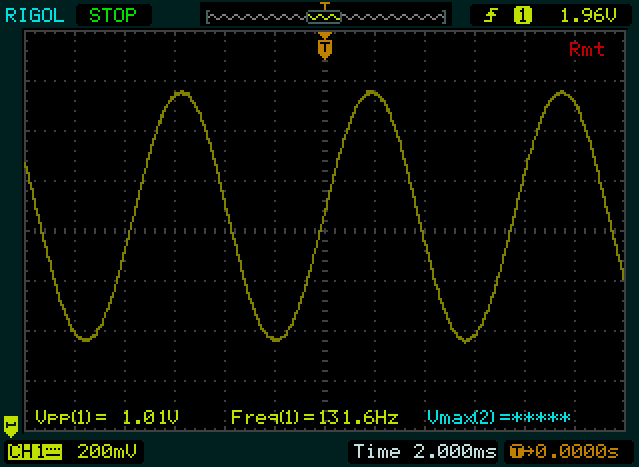 Using the MSP430F5510 I was able to generate a crystal clear 32kHz sine wave. Why would you want to do this? Well, this code can be modified so any arbitrary analog waveform can be generated (reasonably speaking). At the very least you will learn some interesting analog principles if you decide to build this mini-project. First I will start out with some theory. The goal here is to generate an analog sine wave (or any signal for that matter). An analog signal, or a continuous signal, is not something which a microcomputer easily works with unless there are analog peripherals to make the job easy. Even then, things are quite discrete. 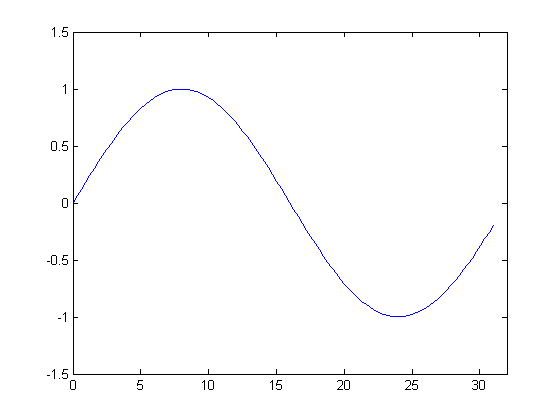 The figures below show a continuous sine wave, and a discrete sine wave. This is very basic theory, feel free to skip ahead to the code. 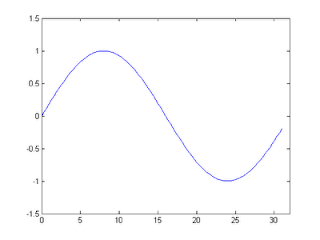 As you can imagine, the more discrete points per period, the more it looks like a continuous sine wave. The minimum points needed (theoretically) to represent a certain frequency is two (see aliasing). In order to have a clean representation of the signal though, quite a few more than two points are needed. For this post I have chosen to use 32 points per period to make a sine wave for the sake of simplicity. This actually can be reduced which will allow for greater speeds while maintaining very good signal quality. Great, now we know how to make an analog signal from a few analog points, but how do we generate these analog points in time? PWM. If you are unfamiliar with PWM, please check out an old post of mine here and the wiki page. By using a digital PWM signal, an analog voltage can be generated which is determined by the duty cycle of the PWM. If you take the average voltage across a single period of PWM by using a capacitor (or low-pass filter) a range of analog values can be generated. So now we can generate the 32 analog points of our sine by using PWM with a little bit of analog circuitry. Before we get to the analog circuitry I thought I would discuss the code first. As always, the code is posted here on github and is embedded below. First, I would like to discuss the sine wave look-up table which is at the top of the code. The array is called wave and consists of the 32 values we need to make a sine wave. It is important to note that even though we have 256 possible duty cycles when using 256 clock pulses per PWM, we never go above 192 or below 64 (for a range of 128). This is very important since all of the instructions which need to get executed every interrupt take clock cycles of their own. If the duty cycle interrupt happens before the other interrupt routine finished, a pulse is missed and the output signal becomes warped. The code itself is quite simple because we are simply generating a PWM using interrupt routines. Again, if this code seems very foreign to you, please check out my post on PWM. The important difference between this code and the typical PWM code is that the duty cycle automatically is changed every period. Every time a new period is started, the interrupt TIMERA0_VECTOR is thrown. Here will increment a counter which keeps place of our position in the sine wave array; we also will reset the counter as needed. The current value which we are going to be outputting is set to the Capture Compare Register 1 (CCR1). Though it is possible to clear or set the output pin without going into an interrupt routine, I thought it was important to show how the CCR1 interrupt is call because it is slightly different than CCR0. A separate interrupt vector, TIMERA1_VECTOR, is thrown when the timer is equal to the value in CCR1. This is also the interrupt vector that is called for any other CCR registers that may be available on the MSP430 and overflows. For example, the MSP430F5510 has a timer with 7 capture compare registers! To determine which register threw the interrupt you must check the TAIV register. To see which bit corresponds to which capture register, see the datasheet for your device. Other than that, if you have read my other posts, you should understand the code. If you have any questions, you know the drill. The PWM signal will need to be average, or smoothed out. If the high frequency components are removed, only the average signal remains. Lets make a quick example before we get to the physical implementation on a breadboard. 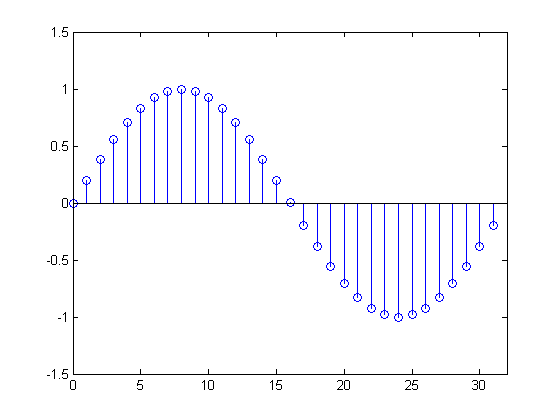 The above image shows a rectified sine wave which is made up of multiple higher frequency sine waves (blue). This will allow us to visualize how filtering works. After filtering the signal using a low-pass filter, which allow only the frequencies lower than the desired rectified sine wave through; realistically it is not a perfectly sharp cutoff and a little low amplitude high frequency components remain. The result is shown above in green. If this is a bit hard to understand, do not worry, this is just some background theory for those who are interested. 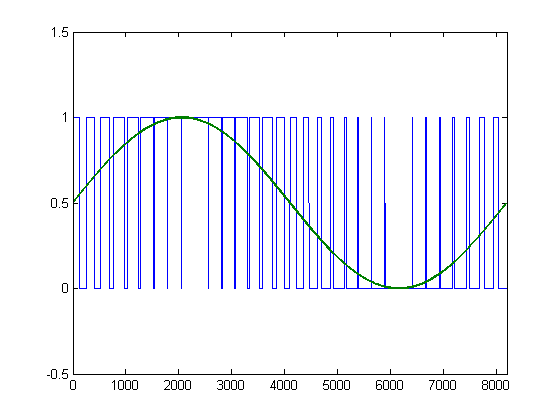 Now, let me show you what our actual PWM output will look like for a sine wave. The above image shows what our PWM output will actually look like. You can see that there are 32 separate PWM periods which make up the sine wave. Each PWM period consists of 256 clock ticks; thus the final sine wave consists of 32*256 = ~8k clock ticks. The final sine wave output is also shown above in green. This is the result of filtering the PWM output signal. For those who are wondering, all of the graphs above were generated in MATLAB. Above is the schematic for all of the analog circuitry that is needed. The analog output, when using the code show above, from the MSP430 will be centered at approximately half of the supply voltage. If we wanted to amplify the signal further, we would need a reference voltage for any amplifier circuitry. For this project we will not do that for the sake of simplicity. Now onto the circuit. It consists of two passive, low-pass filters separated by two voltage followers (buffers). While it is possible to simply cascade the two filters without the buffers, buffers allow impedance matching; a topic which I will not discuss here. Each filter has a cufoff frequency of approximately 160Hz ( 1/(2*pi*10k*.1uF) ) which is slightly above the desired sine wave frequency of 128Hz and much less than the PWM frequency of 4kHz (1MHz/256 clock ticks). Note: If you change the timing of the microcomputer to allow for faster or slower sine waves, you MUST also change the cutoff frequency of the low-pass filters. What does the output look like? This post wouldn’t be complete without some scope captures to show the actual results. I really love when the theory works out and the results can be seen easily. Understanding the theory behind not only digital systems, but also analog circuitry can be a huge help in all sorts of projects. 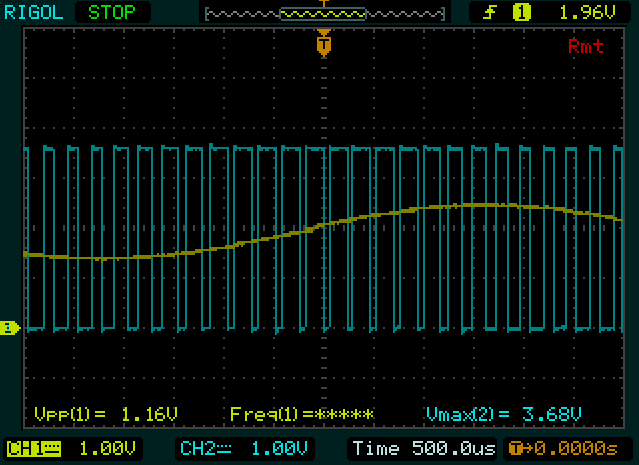 The above image shows both the PWM output from the MSP430 and the sine wave output from the low-pass filters. Very cool! 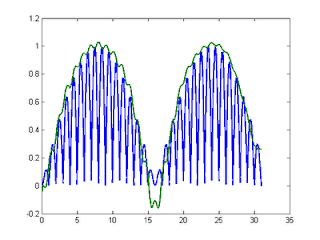 As you can see, the peak to peak voltage of the sine wave is less than the supply voltage (VDD, which is ~3.6V). The picture above allows you to better see the sine wave output which is 1V peak to peak and 131Hz; it sure looks great! To improve the results, some changes can be made to the project. Less points can be used per sine wave, thus increasing the maximum frequency generated. This makes the output more “jagged” but with correct filtering this would not matter. Further, if you want to increase the peak-to-peak voltage or increase the power for any reason, amplification can be used. For all the scope measurements I used a Rigol Oscilloscope (DS1052E) which I discovered through the EEVBlog. It is an amazing scope for the price and I would recommend it to anyone. Personally I think it is much better than the really low end Tektronix which are much more expensive, and I much prefer this to older analog scopes. What’s next? 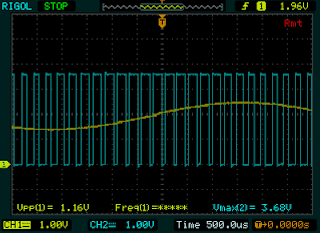 It is possible to change the frequency of the sine wave within the MSP430. This could also be the basis for an arbitrary digital function generated using the MSP430. The possibilities are endless! As always, if you have any questions please comment here or email me. If you want a more immediate answer (since I am busy and sometimes take a while to respond) post your question on 43oh.com/forum. Maybe one day soon I will combine the LaunchScope and this project to create a single, simple, controllable, single test board solution using the DEV.BO. I hope that you found this interesting. I know you all will come up with many cool uses for this project, so please comment and let me know the cool ways which you use the code. You mentioned signal generator ICs, and DAC ICs. I'm new to this whole analog world (my experiance with DACs is limited to NI-DAQs and it is amazing to me that i paid 2500+ for 100 KSPS DAQ (fortuantly somebody else footed the bill :) ), when i can see on Ti's website that 165 MSPS IC costs 30 bucks. I'm still trying to figure out how to send that data to a computer, and was under the impression that it had to be through a microcontroller. Are there more direct ways of interfacing a DAC IC and ADC IC to PC. Excellent article. I find it extremely useful. I am interested in projects, whit PC-feedback and custom hardware projects. Thanks for the article! I'm wondering...is it possible to use easily adapt this method to generate multiple frequencies at once? I'm sure it would be. Depending on the frequency content of your desired signal, you should be able to generate an arbitrary signal using the correct lookup table. Hope that answers your question. Hi: Can I increase the freq to 1 Mhz with success? in thery is possible? Do you mean that you want to increase the frequency of the generated sine wave to 1MHz? In theory this is possible, but given the limited clock speed of the MSP430, you will have some problems with accuracy. Such a system can easily be implemented on an FPGA or higher speed MCU as well. The maximum frequency you can generate is only limited by your maximum clock speed. Where did the values for the lookup table come from? How we're they calculated? Great question. 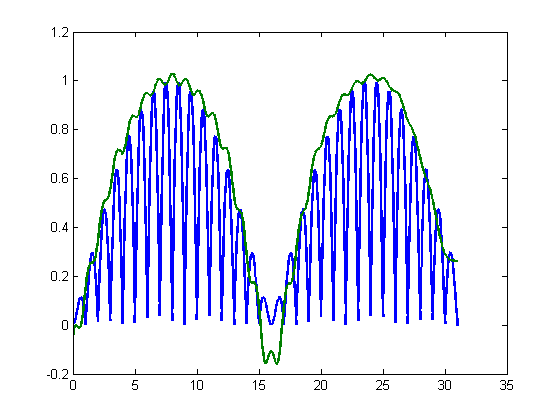 I generated these values in MATLAB (or Octave) so that they would represent a single period of a sine wave (you can see this if you plot them in Excel or MATLAB). The lookup table can be customized for *almost* any waveform you would like to generate. The only thing to know is that 128 is the midpoint and that there should be some extra values between the 0 and the minimum and 255 and the maximum. Hope that answers your question, let me know if any of that was unclear. hi i wanted to generate 50 Hz pure sine wave with more points can you guide me how to do that? can you guide me? If you need a VERY accurate 50Hz sine wave, this is not the method you should be using. If you still want to use this method, I would recommend making sure you can get my code working first. Then once you do so, modify the timing to get your wave to 50Hz. Once you have done this, feel free to add more points. It worked fine for me. Thanks NJC." 60 = 1.1 Mhz/(x*256) which yields x=72, do I need 72 values between 0 and 255? Or can I have more than 72 values? Having more values will increase the quality of the sine wave? Generally speaking, more values will result in a better quality sine wave. Practically speaking, the benefit will most likely not be noticeable. By adding values to the sine wave, the period will be increases, decreasing the frequency. The way to combat this is to then increase the timing of the whole DAC system. Hope that answers your question. You would need to add a counter to keep track of how many periods (cycles) you have currently outputted. Then you can stop the output after 5 cycles have been completed. This whole process can be started when a specific character has been received via UART. Hope that helps! How instantly will the analog output change when there is a change in PWM output?? Will there be any delay?? That is a very good question. The short answer is yes, there will be a slight delay. For most applications, it will be negligible. All filters have a delay, which is generally the phase component of the frequency response. A quick Google search revealed this page. Hope it helps! 1) Can I generate 2 sine waves simultaneously? they may or may not have phase difference. 2) how can i increase the frequency of sine wave output to, say, something close to 700Hz or above? On a device with two timers, it should be fairly easy to make two sine wave simultaneously. While it would be possible to do two waves with a single timer, it would not be a trivial task. To increase the frequency of the sine wave output, all you would need to do is change the period of the timer or modify the output array. Given that this code is written in C, it should be fairly easy to port. The best recommendation I can give is to look at the example code provided by the manufacturer. How can i get that example code sir? I recommend asking on the TI e2e forum. They are very helpful. be lost simply just trying to figure out how to begin. Any recommendations or hints? 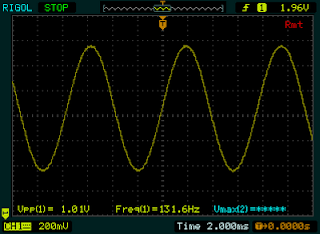 I use a msp430f5438 and I try to generate a sine wave. Here is the code I want a 1 kHz sine but I got 300Hz. I do not know why. can you please tell me how to calculate the frequency of the sine. Where is ur main function? Please provide the entire code. Your code should result in 1.2kHz sine wave, if everything is set up correctly. Have you set up the SMCLK correctly? I believe that this is why the previous posters have asked for your full code. Your article is extremely helpful, I want to accomplish the same thing in MSP430G2553. 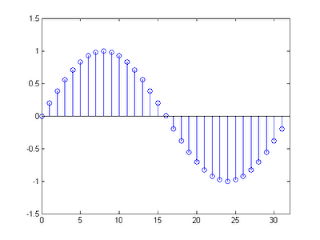 Hence, altering the sine array. So how did you come up with your values in the sine array? is there some mathematically formula for it? You can generate the array using any programming language. I would recommend Python, MATLAB, or Octive if you are familiar with either of them. The process requires you to define your time vector (based on the period of the sine wave and the number of points you want), then calculate and output the sine wave vector. Thank you for this great exlanation, I just want to do the same idea but the differnce is I need 9 DC analog signals using MSP430F5529LP with DAC088S085 , do you have any document or blog to help me as a starting point?